Now that afternoon naps are becoming fewer and shorter for Ben, I’ve had to find ways to keep him busy so I can frantically try and get stuff done while destructo-baby is asleep. 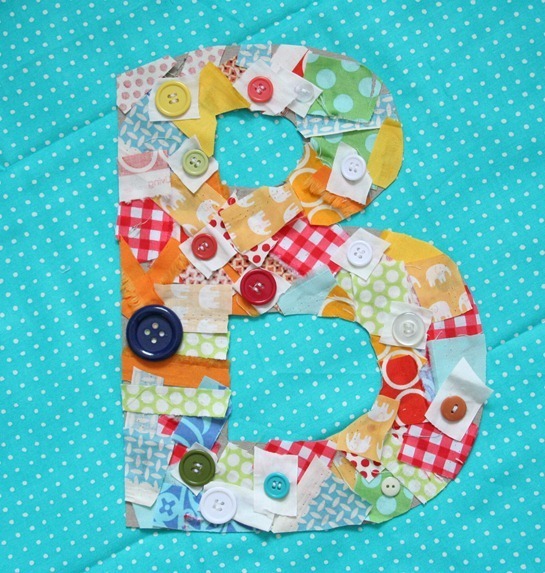 Yesterday we cut out a big cardboard B, and he glued all the fabric scraps and buttons to it. He sat by me for almost an hour getting them all on. After it was all dry (which takes awhile when you give a 3 year old a bottle of glue) I trimmed around the edges. And look how nice and evenly placed those buttons are…. I think he takes after his symmetrically obsessed momma. 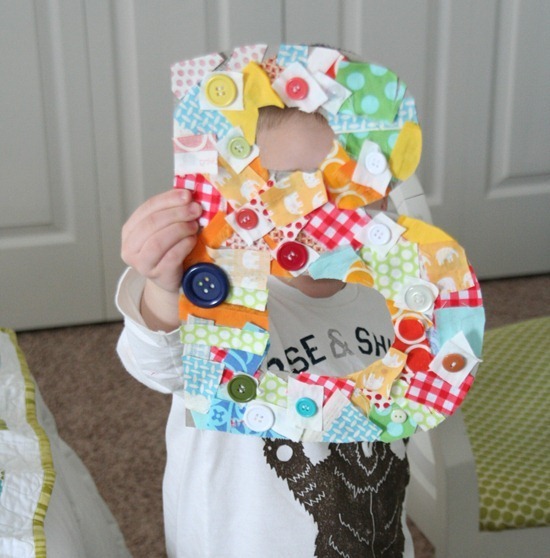 What a cool idea for a craft project for little ones… love the B, too! Great craft idea. I think my grandkids would love that one!!! What a brilliant idea – I'll put it on my "to-do-list"
What a cute craft idea for your son– it came out great! Maybe you can do his name, or even the whole alphabet. I'l check my stash for fabric donations for your church and email you for the address to mail them to you. It is so tragic what has happened in Japan– I'm sure they they will appreciate quilts. Ahhh I LOVE that craft! I can see a giant fabric covored M in my future! WOW, how nice :-) Great thing to do for kids!! I love the idea of that craft. My grandchildren will love it! and I'll check my fabric. I have three bags waiting for a "home." Do you think batiks would be okay too? Love it! I will definitely be making a fabric covered letter A with my 3 year old today. I will email you to get your address. He did a super good job!! You may have seen the idea at http://thepleatedpoppy.com/2011/02/monogram-crafting-with-the-kiddos/. What a cute idea! You can search in Google Reader. I've had the same problem a couple times. I saw something really cute, but forgot where I saw it. Love this idea for my three-year-old son. And I had to laugh when I saw the nickname for your little one…it's the same one we use for my one-year-old daughter. I've never commentes before, but I love that idea! That sounds like a fun thing to do with my kids. And thank you for adding the link about the need for quilts! I'm going to see if I can get my ward or stake to get on board and help out too. Please spread the word, this is a great package! What a great child friendly crafty activity! Love this idea!!! I've been looking for some kind light weight decoration for the kids doors. I've got lots of cardboard. I also need a craft for a playgroup that is coming up. Hmm, maybe not playgroup, not sure I'm ready to let the scraps leave the house and I doubt I have enough scraps for ALL the little girls. We are SO doing this!!! So cute! Great idea! I love this scrappy but definitely not crappy idea! can you please email me the address i could send some fabric to? My email is megs.patterson@yahoo.com . I LOVE your blog! I love to quilt but never make the time :( thanks for all the cute ideas and inspiration. That looks great! I'll have to try it out when my little one is a bit older. We used the chip board letters, I am finding this GREAT for learning the alphabet for my 3 year old. THis is genius. I'm going to have to try this one. So sorry about the growing out of naps phase. Sent me into a state of mourning with each kid. Very cool idea of design any alphabets. Impressive work. Ohhhh such a great idea! My 4yo will love this; I have the same dilemma, wanting to get a few things done while the baby is asleep but with a non-napping pre-schooler in tow! This is a great idea and it reminds me to get my 3.5 yr old more involved in my quilting. She is constantly looking for something crafty to do while I'm sewing and I forget that there are fun things she can do without needles and pins! Thank you so much for sharing. Oh, just another note: this would be a great use of the cardboard that comes on the back of Layer Cakes and Charm Packs. What a cute idea! I'm definitely trying this. Also I absolutely love your elephant marching quilt. Is there a pattern available for that? If so I would love to know where I could buy it or find it. My e-mail is halltaryn at gmail.com. Really cute project for those busy little hands and love that it uses those tiny scraps that some of us are always saving. Thanks for "reposting" or I may have never seen it! oooh … i wish my ward/stake would do this … i emailed the ward rs pres and the humanitarian leader … the productivity on a ward/stake basis would be amazing …. thanks for the link to providentliving.com …. like others have said- if you go to your google reader there is a search bar at the top. Just type what you are looking for and it should pop up. This has saved me a few times with recipes and patterns. when i find a great idea on reader, i either add star, like and share (that way, i can go back and find it under starred items) or it gets bookmarked under my crafts to do folder. That's awesome!! 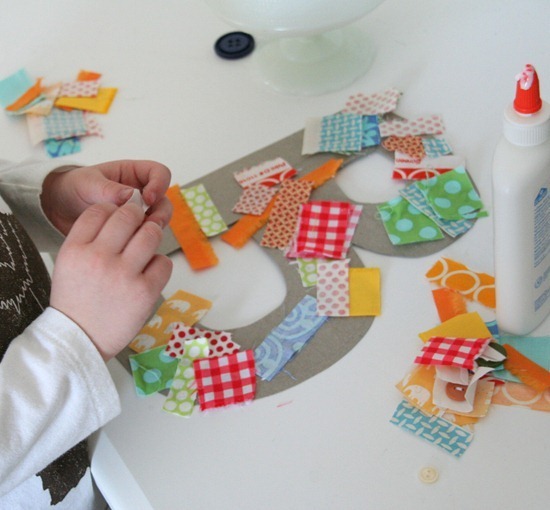 I'm on a quest for projects that use up scraps, I'll be sure to try this with my kids and send you some link love! I made these with my boys after seeing your post! The came out so cute!! oh how cute! Recently my 3yr. old twins made at their preschool little "quilts" by cluing fabrics onto a cardboard and then the teacher cut them at large diamond shaped pieces so that they looked like the quilt was spread out on the ground under their learning trees at home for the letter "Q"
After reading your post and seeing this great project – what a cool way to decorate a sewing room… with letters "I love Quilting" or "I heart fabric!" or "will work for fabric"
Thanks for the great idea – we are always looking for ideas for our curriculum kits. We give them out monthly to Family Day Care Homes on our program – such a good idea!